One common Repetitive Stress Injury (RSI) is Carpal Tunnel Syndrome (CTS). So what is carpal tunnel syndrome, where does it come from and what carpal tunnel syndrome yoga exercises are there to help relieve the symptoms or possibly prevent them? We used to know CTS as "tennis arm". These days more people are suffering from symptoms of CTS because of their work in front of the computer and not because they are playing too much tennis!! So more and more people are looking to relieve the symptoms of carpal tunnel syndrome before they have to go into surgery. Before I go into yoga exercises for carpal tunnel syndrome, here is what it is and what the symptoms are. The symptoms of CTS involve the median nerve which starts at C5 - this is the mid-lower part of your neck - and it travels down the arm, in front of the elbow down the forearm into the hand through a rigid passageway of ligaments and bones at the base of the hand. Through this passageway go the median nerve and tendons (tendons connect muscles to bones). 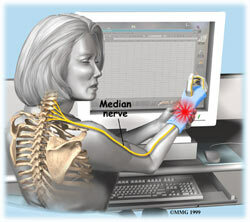 When the median nerve gets squeezed or pressed at the wrist symptoms of carpal tunnel syndrome occur. These mostly start gradually. Frequent burning, tingling, itching or numbness in the pal of the hand and the fingers may occur. When tingling begins start doing these gentle slow hand yoga exercises. These yoga exercises are done slowly with awareness and exercise all muscles of the wrist and also restore circulation. They also get your wrist out of the bent position that normally brings on the symptoms of carpal tunnel syndrome. As the median nerve runs down from the side of the neck it is important to loosen up muscles in neck and shoulders as well. Exercising every day and relaxing all the muscles in the body that are giving you problems is essential - even when you are not in pain. Do these carpal tunnel syndrome yoga exercises at least four times a day. Do them slowly - awareness and relaxed breathing are the key! !